A sales location near you. First time buyer promo 8.5 x 11 in. poster [PDF] - Print this poster and help spread the word! Get a major price break on your hunting or trapping license if you haven't purchased that type of license or haven't purchased a license that includes that privilege in any of the last 10 years. Discounted fees are available for residents and nonresidents alike and are automatically applied when you buy a license. Try it -- you'll like it! 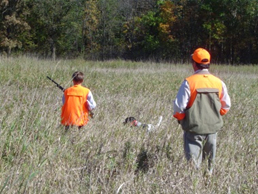 Certain hunting and trapping approvals are sold at a reduced fee to people who have not been issued that same type of license, or a conservation patron license, or a sports license, in any of the previous 10 years. 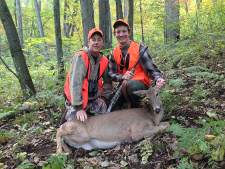 For Wisconsin residents, $5 buys you an annual license for trapping, or many hunting seasons. Nonresidents also qualify for discount rates. Pick the licensing option that works best for you! Our system will automatically apply the discount. Recognize that special person who introduced you to the sport. Let us know and we'll reward him or her with points toward a discounted license the next year. Wisconsin residents who have been designated as a recruiter three or more times within one license year are eligible for a discount on the license of their choice the next year. Give us a call at 1-888-936-7463 and be ready to give your customer number and your recruiter's customer number. Recruiter points are available only for Wisconsin residents.Give credit where credit is due! Get a line on where to go outdoors! Wisconsin has unparalleled freshwater fishing, hunting and trapping. We think you'll get hooked on Wisconsin's great outdoors.